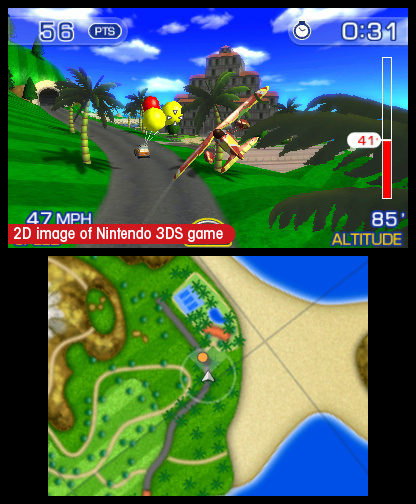 Pilotwings Resort puts the player in the pilot’s seat as never before in this long-awaited three-dimensional update to the Pilotwings™ series! 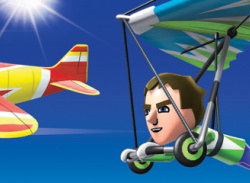 Import your Mii™ characters from the Nintendo 3DS Mii Maker™ and explore Wuhu Island (the star of Wii Sports Resort™ and Wii Fit™ Plus) by plane, by hang glider and by rocket belt. 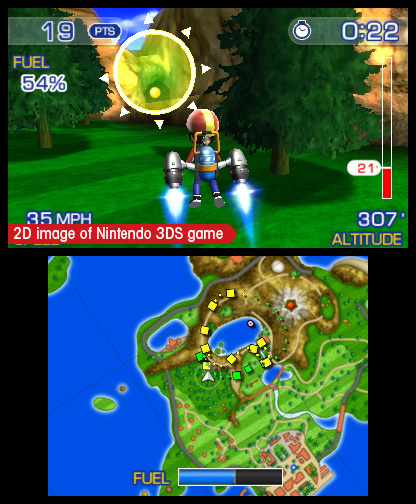 Each vehicle type features unique controls that offer a different challenge. 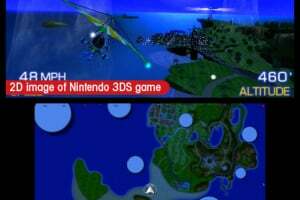 Complete around 40 challenging flight missions in Mission Mode to earn stars, or scour Wuhu Island for hundreds of collectible Extras in Free Flight Mode as you unlock interactive 3D Dioramas of various aircraft and famous island monuments. 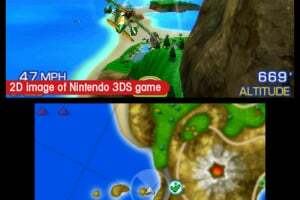 Get a bird’s-eye view of familiar Wuhu Island sites – and a few new ones! 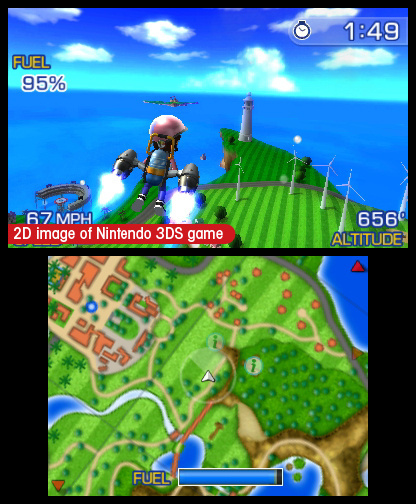 You can even share your experiences with friends and family members by taking in-game photos and saving them to the Nintendo 3DS photo album. 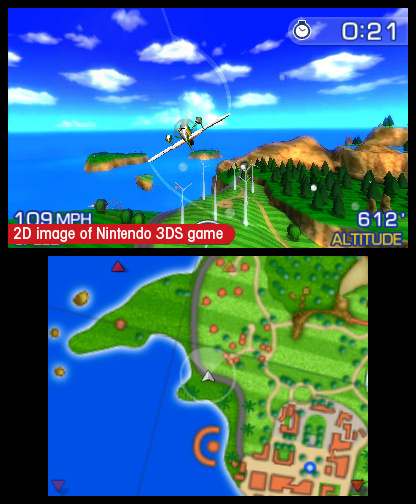 Pilotwings Resort is an aerial sports game gem that offers amazing 3D views of Wuhu Island. 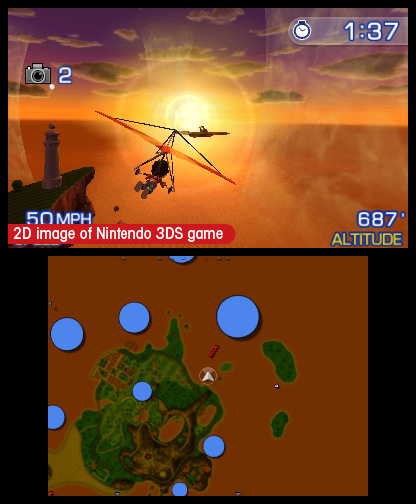 Take control of an amazing 3D flying experience with your Mii characters. 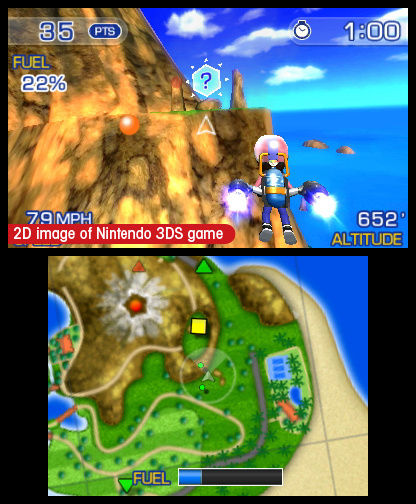 Pilotwings Resort pulls your personal Mii character from the Mii Maker application, and features the Mii as the star of this adventure. Share the fun with family and friends. 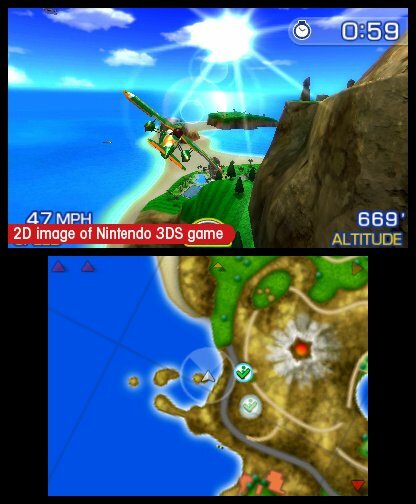 You can snap photos of postcard-perfect locales on Wuhu Island with the hang glider in Free Flight Mode and as part of select challenges in Mission Flight Mode. Hmm...mixed feelings about this. 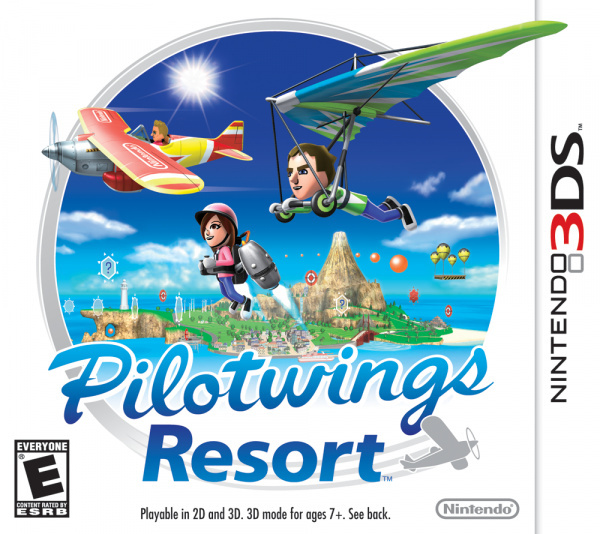 I've been waiting ages for a new PilotWings game, but this is just set on the Wii fit/ Wii Sports Resort island, which you could already fly over in WSR. Ehh..
Not sold on it yet, but I'm interested. 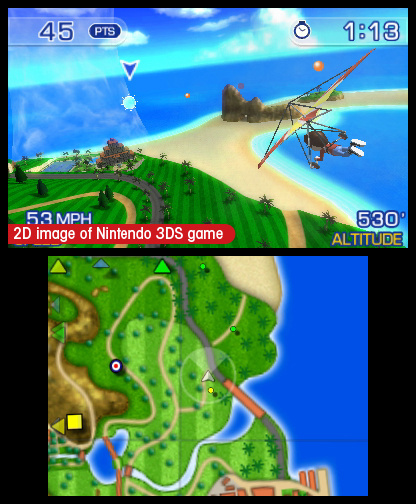 Wii sports resort flyover, sure, but the thing is theres gonna be more vehicles then just a plane, its portable, and it will probobly be in 3d. 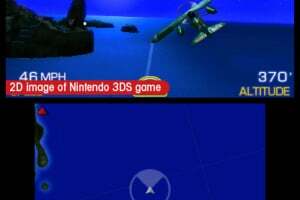 hmmmmm... need to know more if its just an amped up version of island flyover ill skip it. Uh, this looks REALLY familiar. @pokermonbw94 That's probably because in one screenshot there's a Mii! 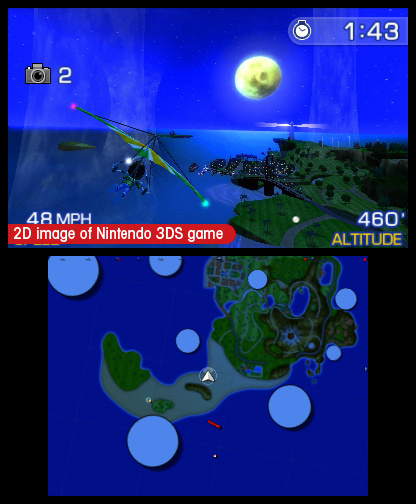 Miis on 3DS- You heard it here... probably not first but you heard it here at least. My podcast is being quoted: I've made it, ma! |sf>I wonder if this will use some of the gyroscopic features of the hardware. 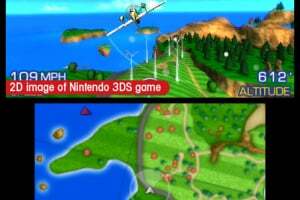 I wasn't impressed by SNES Pilotwings (which I tried on VC), but I greatly enjoy the plane game within the Wii Sports Resort. 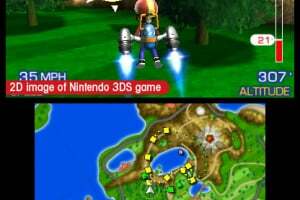 It would be a nice tip of the hat for Nintendo to have this completed for launch. Once theres more information about this game ill make a decision if ill buy it or not. 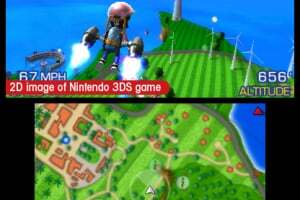 But a flying game would be awesome on the 3DS if done right. 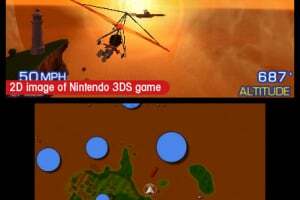 I really dont play any flying games so ill defentally be looking foward to this game. 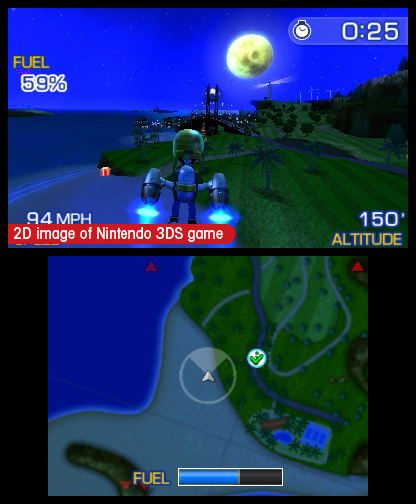 Would've been more intriguing to have a wiimotionplus pilotwings imho. Will this have gyroscopic tilt control? 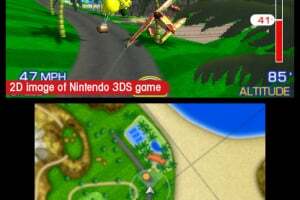 This could be really good if they expand on the Wii Sports Resort flying game and add a lot more content and things to do. 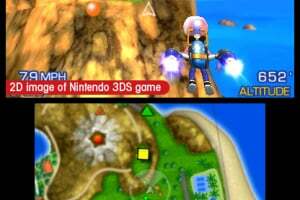 I really liked the flying game. I hope you can do a lot more than fly an airplane, hangglide, and jetpack, it seems like there should be at least 10 different things you could choose to do. But this will probably be my first purchase. Gonna be a day one purchase for me! It'll be a day-one buy here too! 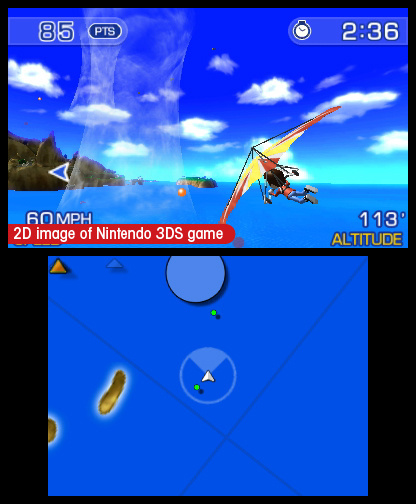 @#15: It's supposed to be the same island. Looks great but also looks like the type of game that you'll run out of stuff to do in within several hours. There is also enjoying the 3D visuals in this game, though. This is a ridiculously good game. Can't get enough of it, and am currently 5 hours in, just seen the credits for the first time, unlocked the extra class and haven't even touched free flight mode. This game is balanced to perfection. A complete joy and work of art from start to finish, and will take you 10-15 hours to get 100% and perfect on everything. Despite there being only one island (a major hangup for a lot of reviewers) it is constantly inventive and full of surprises. It took my 9h30 to three-star all 42 missions and find everything in free Flight Mode. 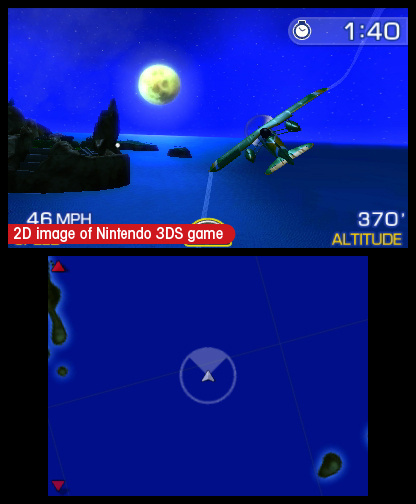 In fact, Free Flight mode took me longer than mission mode. I'm going to chip away at getting perfects now...very tricky... I could be a while! #25 is right. The game only lasted 16 hours for me and I haven't touched it in a while. I've logged in over 18 hours and I'm still not quite finished flight mode....Well almost! Best 3DS game that i've got! 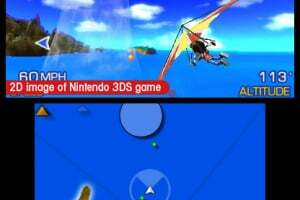 better than monkey ball and nintendogs! Love this game, the sound quality, the picture quality, everything. It's beautiful. Apprently this is a really good game. 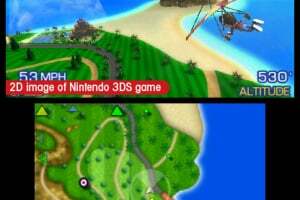 that would be cool if you can also go in a cabin or the cabanas on the beach, or the two hotels... its hard to hear the mario sounds because of the loud music... you can quiet the music but will it quiet the mario as well? This game looks like something that I would enjoy quite a lot but I refuse to pay $40 for it. Nope.